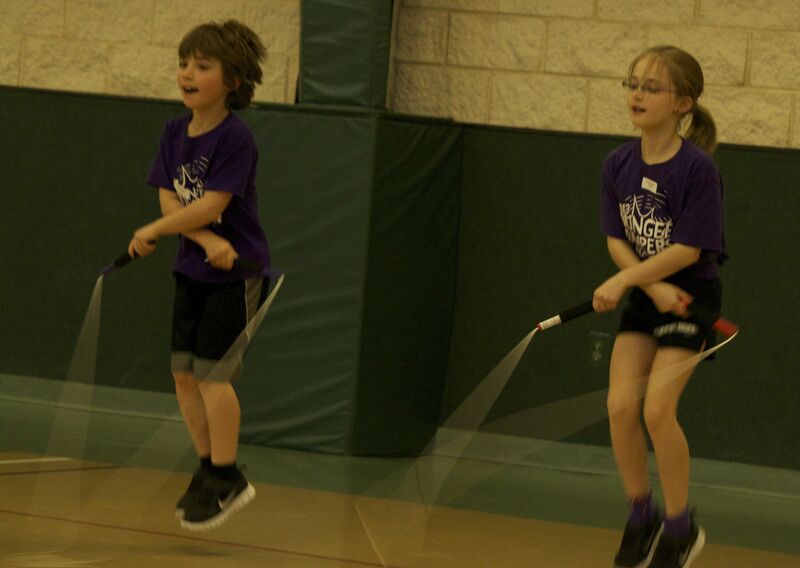 Julio Ermigiotti, 8, and Cassidy Ermigiotti, 10, jump rope in unison. Photo by Bailey Fucanan. A young girl jumping rope isn’t an unusual sight, but this one, 10-year-old Cassidy Ermigiotti, is jumping in perfect unison with her 8-year-old brother, Julio. If you listen closely, you’ll hear Cassidy calling out cues. “I jump 20 minutes each night,” says Cassidy. “It’s a lot of fun and it keeps you healthy.” The fourth-grader also plays softball and dances. “Dancing helps with jump rope,” she adds. Second-grader Julio is on a baseball and travel baseball team. “Jump rope helps him with running fast and transitions,” Cassidy says, fulfilling that age-old task of speaking for younger siblings. 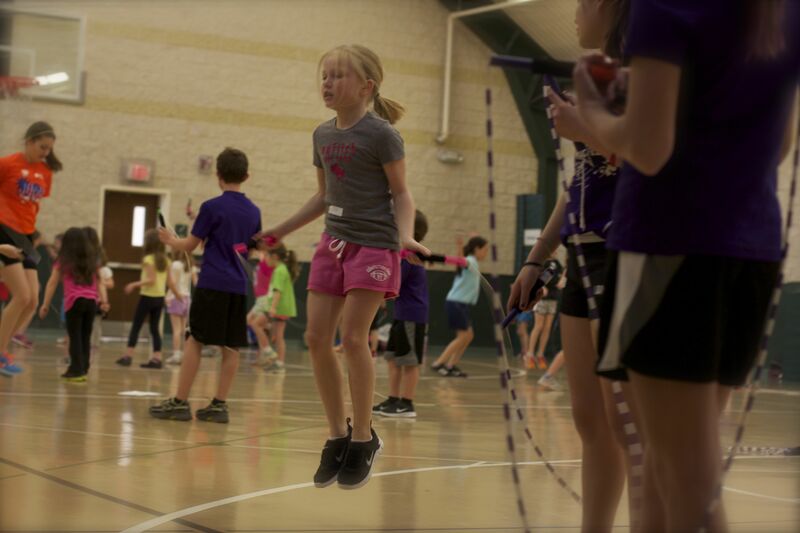 The Doylestown duo, members of Bucks County Bungee Jumpers, are attending a jump rope clinic sponsored by Just Jumpin’ Jump Rope Camp, begun five years ago by physical education teacher Justin Pillmore. Pillmore started teaching jump rope – long the realm of boxers, fitness buffs and pig-tailed girls on the playground – to make his students more active. 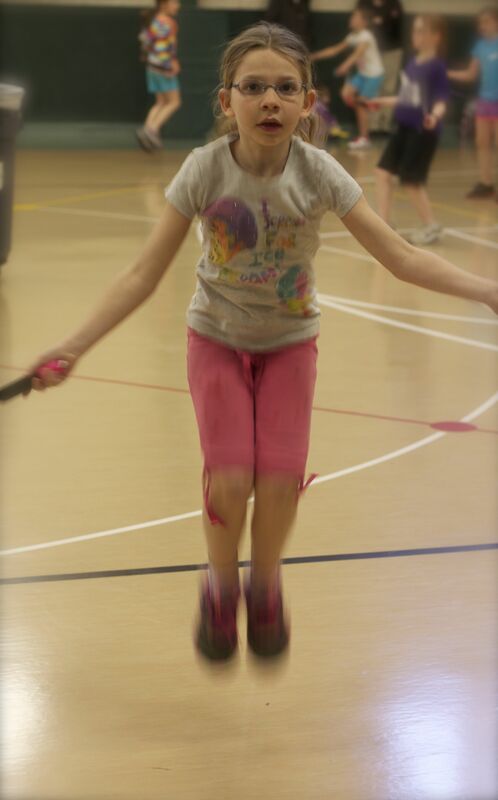 They may be pig-tailed and dressed in pink, but this is not the jump rope you’d find on your typical playground. Bucks County Bungee Jumpers do all sorts of crazy tricks, including jumping on pogo sticks. Photo by Bailey Fucanan. Today the Bucks County Bungee Jumpers have two teams of 13, kids aged 5 to 12, who perform at school assemblies and half-time shows from New York to Maryland. Next year, the teams will start competing. Just Jumpin’ Jump Rope Camp, the feeder group for Bungee Jumpers, has grown from one weeklong summer camp for 30 kids in 2008 to several weeklong camps last year serving more than 500 kids. They also have clinics throughout the school year. These kids barely take a break in an hour and a half of jumping rope. Photo by Bailey Fucanan. 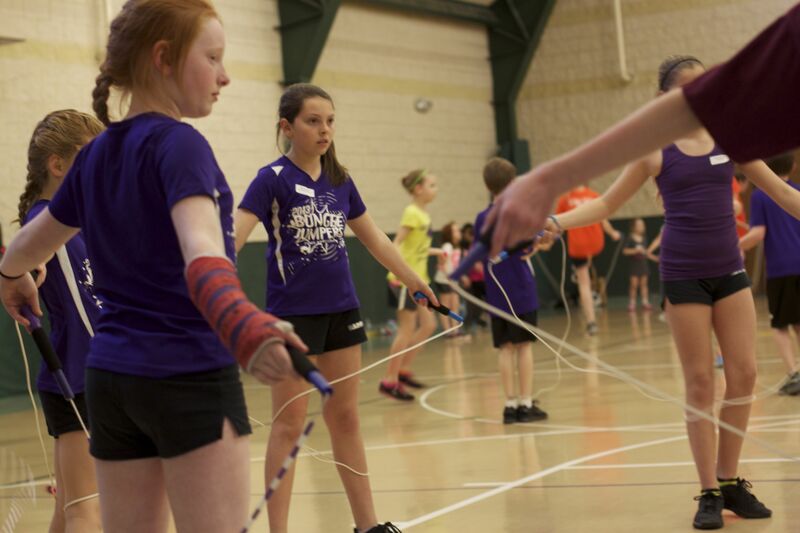 Clinics are often held on school holidays, which is fine with jump ropers’ mom Brandyn Bissinger. “It’s great because they get the wiggles out and it gets them off the couch,” she says of son Tyler Taurino, 7, and daughter Tessa Taurino, nearly 6. At a recent clinic held at First Baptist Church of Doylestown some 60 kids are learning from 10 members of Holy Trinity High Flyers, a Pittsburgh-area competitive team with members from age 11 to 18. This team is known for their displays of talent with jump rope. They even jump rope on their butts. While some little ones are off learning the basics, Cassidy works on mastering something I never tried during my brief tenure as one of those pig-tailed little girls entertaining herself during recess. I’m sure the trick has a name, but I’m wary of the snapping rope as Cassidy tries again and again. “You’ve nearly got it,” one of the High Flyers says. Learning jump rope tricks doesn’t stop even when your arm is in a cast. Photo by Bailey Fucanan. Another High Flyer – clinics and camps are normally staffed by Central Bucks School District teachers – teaches a fancy trick to a youngster with an arm cast who can’t do the handstands her group is practicing. You wrap the rope around your legs, crossing it in front, then drop one handle. Kick the rope up and grab the handle. Yes, it seems as hard to accomplish as it is to explain. Although clearly outnumbered by girls, boys participate too. There’s Julio and Tyler. And also 11-year-old friends from Yardley, Brandon Ferraro and Miles Borowsky. It’s the Pennwood Middle Schoolers’ second and first year as Bungee Jumpers, respectively. Brandon plays soccer on a travel team and also basketball at school. Miles is a competitive swimmer. There’s no shortage of community theater opportunities in Bucks County. One that has flown under my radar is Acting Naturally, a nonprofit that teaches acting, singing and dancing. Acting Naturally’s Youth Company presents Thoroughly Modern Millie at the Newtown Theatre April 5, 6 and 7. I’d welcome some comments from members and their parents about the experience of joining the company. I’m also curious how many community members who are unrelated to the performers attend the show. Tickets are $12 and $15.